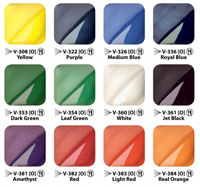 All colors are LEAD FREE and AP Non-Toxic. 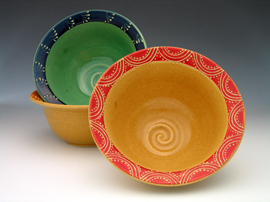 Charan Sachar, Federal Way, Washington, used AMACO Velvet Underglazes on bowls shown to the left. 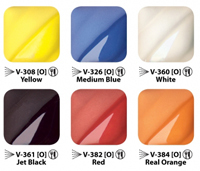 V-361 Jet Black, V-382 Red, and V-384 Real Orange. Amaco Underglaze Class Packs are 20% Off List Price. V-382 Red, V-383 Light Red, and V-384 Real Orange.